I don’t know about you but in my opinion, Valves are the heart of an air compressor. The performance of a reciprocating air compressor mostly depends on a suction filter, valves, and piston rings. Hence due care required to be taken. Above mentioned parts especially valves require a periodic inspection and maintenance. Here you will find important information about plate type suction and discharge valves. These types of valves are used in Kirloskar Pneumatic and Chicago Pneumatic Air Compressor. Ingersoll Rand also uses plate type valve in their compressor but in a square shape. The Maintainance is almost same for any types of compressor. Below information will definitely help you in servicing of suction and discharge valves of the reciprocating air compressor. To avoid damage to the valves and inner dowel pins, it is suggested to use a simple fixture for dismantling and assemble valves. These fixtures are supplied by compressor manufacturer on a chargeable basis or you can manufacture at your engineering unit also. A detail drawing is always available in an instruction manual. Use proper size spanner for opening and tightening. Never hold the valve directly in a vice and do not hammer on spanner when loosening or tightening the castle nut. Examine all the parts thoroughly after dismantled the valve. Remove carbon formation with help of Trichloroethylene or diesel and light scraping paper or brush. Don’t scratch the valve plate or seat while cleaning. Completely dry out the valves before installing it on a compressor. Never use cotton waste to clean the internal parts of the valve, use only cloth for drying out. A dry air can also be used for this purpose. When valve plate, damper plate, spring plate shows sign of wear, it is imperative to replace these parts, even if no breakage has occurred. 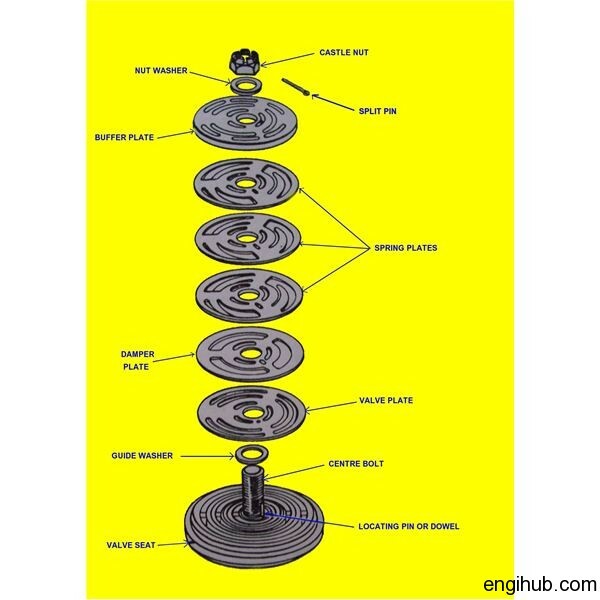 A maximum wear of about 10 % of the total thickness of valve plate is allowed. For highest efficiency of the valve, it is important that the seat face is flat and free from any traces of wear. This prevents the valve leakage. If any damage to the seat observed, it is recommended to replace the same. Due to the presence of dowel pins, re-machining or lapping cannot be carried out. It is also suggested to use a new valve plate with a new valve seat. A) Carry out valve assembly in the required sequence. Use fixture for proper tightening of valve nut. Check valve plate for free movement. B) The hollow side of the thin part in the centre of the valve plate must be placed upward facing, valve keeper. C) Suction valves are equipped with unloader, the clearance between the valve plate and unloader lifter as well as the clearance between unloading piston and lifter must be checked. D) Test valve for leakage and ensure it made dry after testing. Use air pressure instrument for testing purpose. Never use petrol, diesel or kerosene for inspection. E) Valve cover nuts have to be tightened with specific torque by a torque wrench. This is all about the proper maintenance of suction and discharge valves of an air compressor. Hope you like it. Water Turbines: Why Water Turbines are developed? Why is Buffer Plate provided on this Valve?